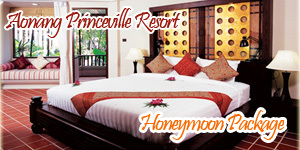 Browse > Home / Reviews / Amazing Krabi, Thailand. Traviss and Carly were actually the ones who recommended Krabi to me…I am forever in their debt for learning about such a place and the recommendations they gave me for in and around the area. It was their favorite place in Thailand and now mine! Actually it is my favorite place in the world! Not so much the town itself but the whole area and what it has to offer: the proximity to tropical beaches and remote islands with millions of things to see and do on the cheap! Figure in the excellent food and the friendly Thai people and it all added up to an amazing experience!!! Krabi with Becky was a blast, enjoyed hanging with her doing the beach and food and shopping thing. Becky eventually travelled on to Ko Phang Na a popular Island on the East coast of Thailand for the full moon party there. The full moon party is basically a huge all night rave attended to by thousands of mostly western partiers…an event that shouldn’t be missed by anyone visiting Thailand. We parted company but by the time we did I had come back into my own and felt able to handle things a little better than when I was in Penang!!! Beautiful weather, beautiful beaches, great food, awesome people and I was beginning to meet other travellers, life was good. 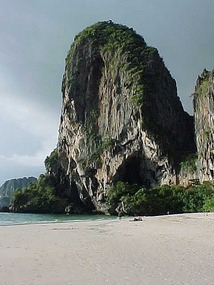 My initial reason for travelling to Krabi was to rock climb so I went to Railay beach to check it out. 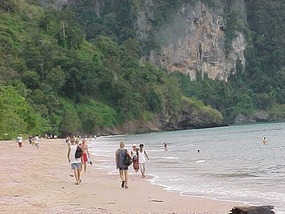 Railay beach is a stunning place that can only be reached by a long tail boat ride (see pictures for a view of a long tail) It has three or four beach areas with sand that is white and ‘crunchy’ and crystal clear blue water. There are no vehicles here which only adds to its allure. On the ride over I met Kate. 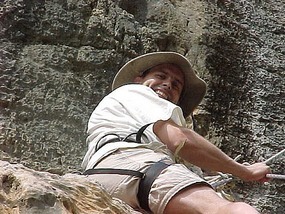 A cool Brit from Leeds who was also going to rock climb. We ended up in the same course and hung out thereafter for a few days. The rock climbing course was pretty basic but it was great to hang out with a few people who shared the same interest and to do something that was familiar to me! The introductory half day course cost me 500 Baht which is equivalent to $20.00 CDN!! 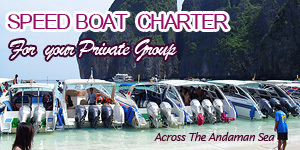 Kate and I returned to Krabi that night on a long tail in a middle of a squall the only time I was ever freezing the entire month! Kate’s friend Claire came from Australia the next day and we all hung out a bit and met up with a friend of Kate’s from University. It amazes me the frequency of which people meet friends of theirs from home. Hasn’t happened to me yet! I had spent about five days in Krabi and was itching to go somewhere else. I caught wind of an Island called Ko Lanta which was supposed to be beautiful and largely undeveloped so I decided to head there. Coincidentally Kate had booked a spot on the same island with her travelling companion Claire. They headed off and I followed the next day. Unfortunately the places we booked were quite a ways apart, actually not unfortunate as driving to their Villa on a scooter that evening ended up being one of the most memorable moments of the trip so far. So we were able to meet up and hang out a wee bit longer and enjoy more great conversation. Kate and Claire left for Bangkok the next day and again I was on my own.